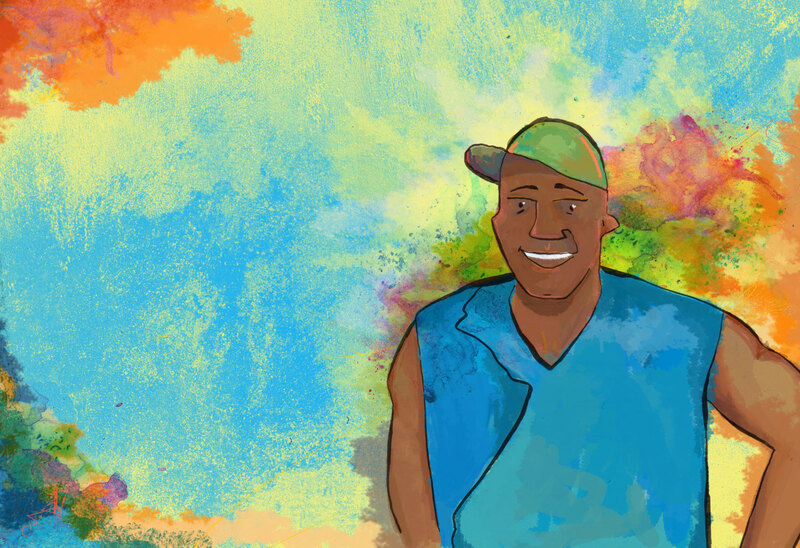 Farmer Will Allen and the Growing Table, is Eric-Shabazz Larkin’s stunning debut into the world of children’s literature. The book is written by Jacqueline Briggs Martin and published by Readers to Eaters Books in 2013. It has received critical acclaim. 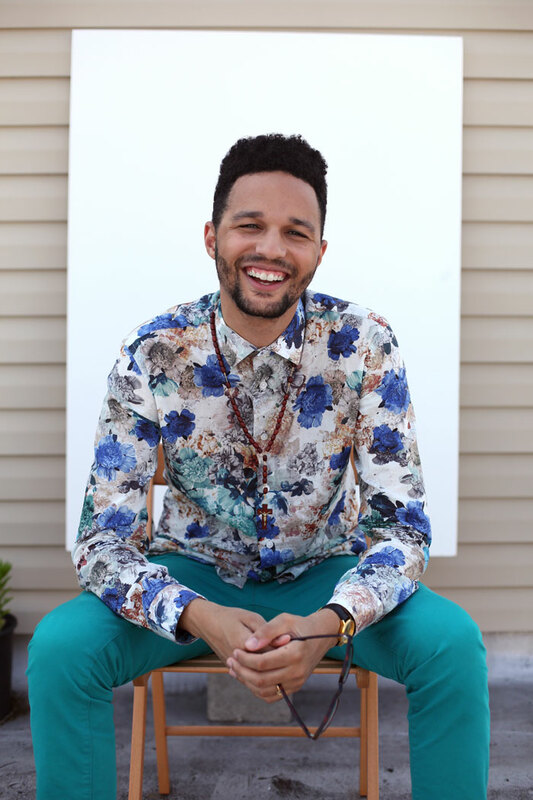 Eric-Shabazz Larkin a founder of the Creative School of Thought, a group of artists that produce content for public art and social change. A native of Virginia, he lives in New York City. His Journey – Reclaiming a lost romance. My first romance in the world was with illustration. I used to curl up with a pen and a pad and just go for hours on in. In the house. At the park. On the table. Under the table. Somewhere along the line, someone told me that artists don’t make money and I should choose another thing to love. I hate that I listened – but I did. 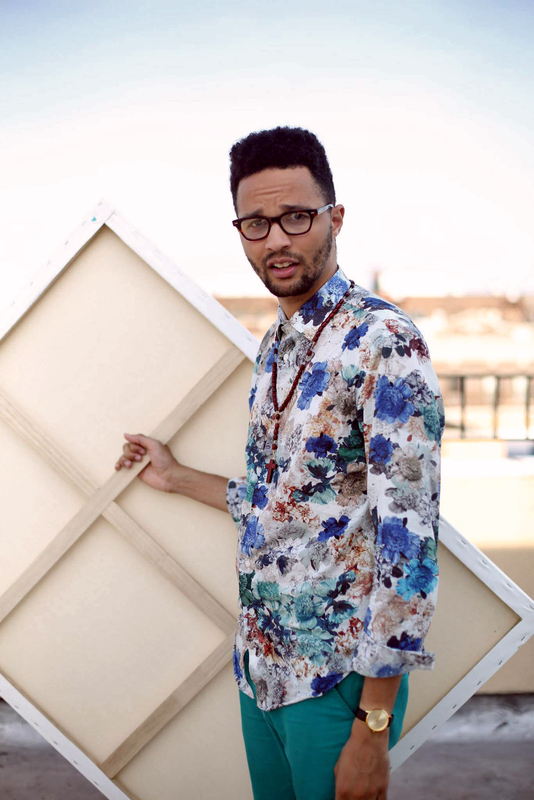 So, what does an artist with a financial complex do when they grow up? Advertising. I’ve worked in advertising for many years. I grew a deeper love for the craft of creativity. But it wasn’t long before my original love started calling my phone. Literally. I got a call from a publishing company, Readers to Eaters. They had seen my illustrations online and asked me to do a book for them. I told them I was too busy. Somewhere inside, a little boy that used to be me, was disapproving of me. So when they were persistent about it, I caved. I’m a sucker for anything that sounds like a fun creative project. I’m already working on a second book, with the same publishing company. It’s called, “A Moose Boosh,” a collection of poems to be read at supper to make dinner time special again. 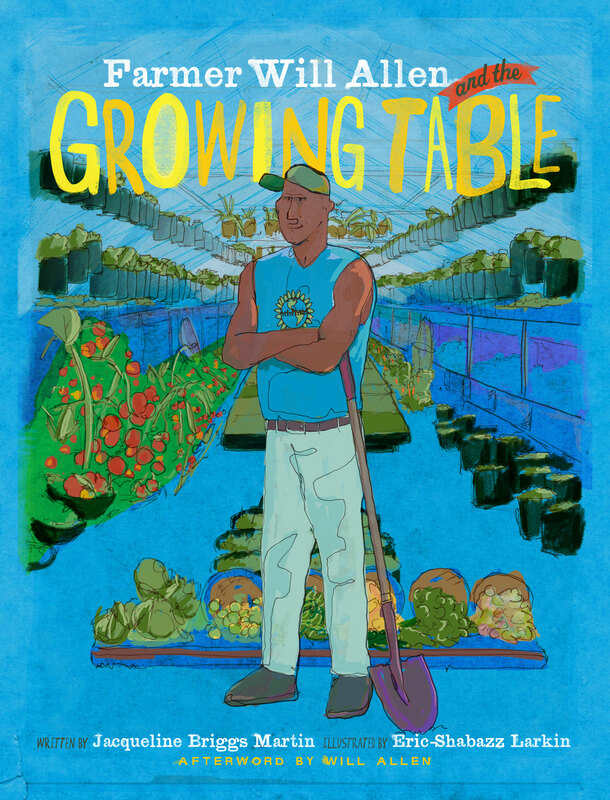 Will Allen and The Growing Table is a wonderful book about a man that deserves a hundred books. 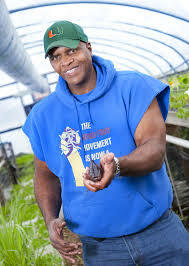 Will Allen is a real farmer that claimed his green thumb as a child, but went on to play pro basketball, moved to Belgium only to move back to Milwaukee and re-invent the way we do farming in urban cities. Will Allen is known for his method of farming called, “vertical stacking,” which essentially means, his farms acres that are typical led spread out over miles are stacked on top of each other because to the limitations of space in cities. I was really excited to find that he was a black man. It’s not ordinary for black men to be heroes in children’s books that have nothing to do with politics, slavery or civil rights. For that reason, I felt this project could truly be unique. It was fun to see how a story is told over and over and over with every illustration decision I make. So, when illustrating this book I wanted to be sure to capture the textures and the colors of the farm. 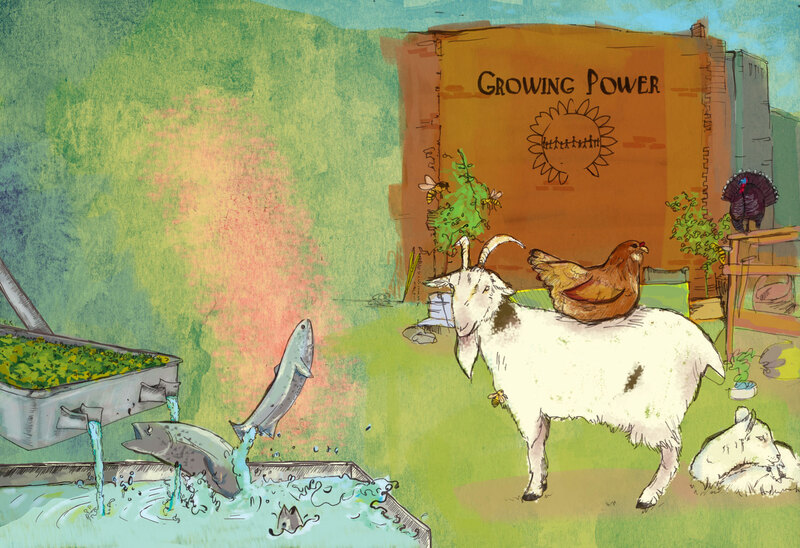 In particular, Will Allen’s farm called, Growing Power. Even though people come to visit his farm from all over the world, there is nothing really fancy to see. He uses, shipping pallets, old crates, worms, dirt and buckets. So instead of using the same white paper texture, every page of the book was illustrated on a different texture you might find at the farm: wood, crumpled trash bags, old paper, burlap and more. 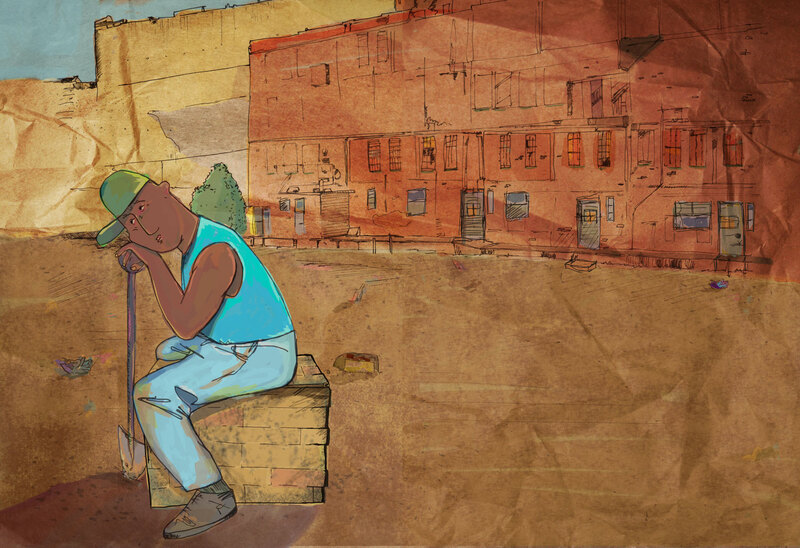 We also used color to help tell the story of Will Allen’s development throughout the story. He starts the book as a young boy that hates farming and grows to be a man that draws whole communities out to farm with him. The colors of the book reflect that, moving from these sad deep browns and greys to a very lush, vibrant, colorful book. The first time I saw one of his paintings, it made me completely rethink about the way I see myself, my race and my identity. His paintings brought me to tears. It was the first time that I realized that there was a place in the world for black art and place in the art world for black people. He made me want to be one of those people. I watched a video of her talking about her work and she said that there is a lot of paintings that explore what it looks like to be black, but she wanted to paint what it felt like. There is something magical about her expression of blackness that makes me see my people differently. And, that’s just one of the reasons I want to give this book to everyone! The play of light and texture is just amazing. Thank you, Mr. Larkin. You have no idea how much you’ve just inspired me! I am a an author an illustrator who designs for a non-profit and about to publish my first project. You’ve just renewed hope in my own project with your story. Don’t ever stop!